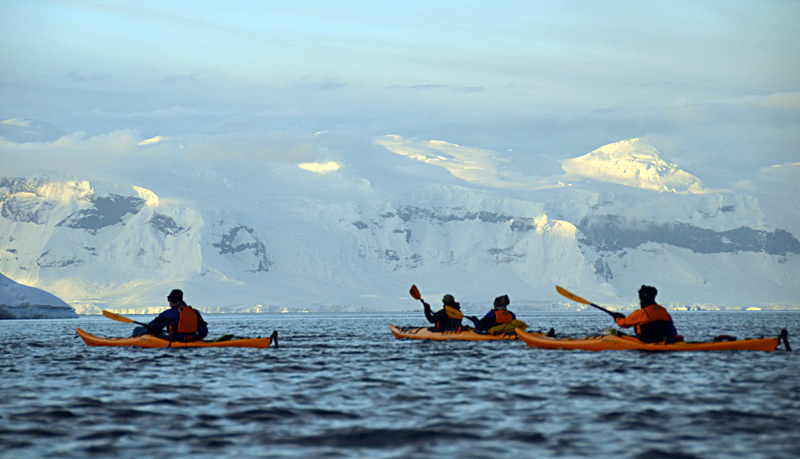 A Southern Paddling Destination; SUPing and Kayaking in Antarctica. I just got back from a southern paddling holiday before the Canadian winter really kicks in. 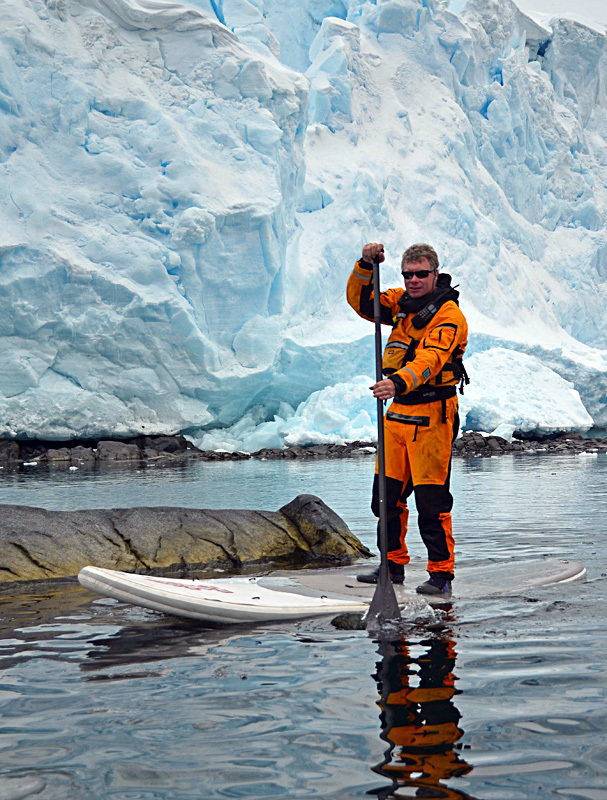 My tan is only from the neck up as I was in Antarctica with One Ocean Expeditions http://www.oneoceanexpeditions.com, working as sea kayak guide for their “Off the Beaten Track” Expedition, a 2 week Antarctic journey that offered overnight kayak camping along with expedition photography, snowshoeing and ski touring in addition to their regular landings, and day kayak program. It was an incredible experience. It was late spring but on the Antarctic peninsula, and that meant we had snow several times during the 2 week trip and temperatures averaged just above zero celcius. The landscape is spectacular. It’s big and beautiful and there is a lot of ice. Rugged mountains frame ice sheets, glaciers while icebergs and pack ice dance with the wind and tides. It is really magnificent with pure, white slopes and cliffs and steep jagged peaks everywhere. We sailed from Ushuaia, Argentina aboard the 117 meter, 96 passenger Akademik Ioffe across the Drake passage (moderate seas on the way down but a force 10 gale on the way back). We cruised around the Shetland Islands, the Gerlache Straight and the Danco Coast, making frequent landings at penguin colonies, scientific stations and zodiac or kayak cruises. Many of our best views were from the ship, including a pod of Orca whales hunting a leopard seal stranded on some pack ice. But getting on land, or even better, on the water were the best experiences. The wildlife is definitely one of the highlights. We saw lots of seabirds including the Wandering Albatross with a wingspan of up to 3 meters. 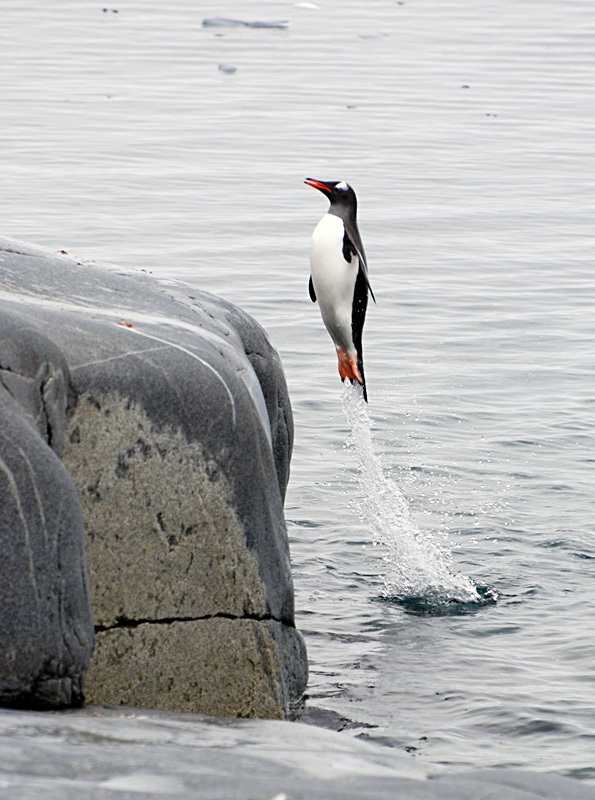 The southern ocean is a rich ecosystem supporting large populations of penguins and sea mammals. We tried to stay 5 meters from penguins on land but some of them obviously haven’t read the rules and would wander up to you to say hello. It is pretty cool to see be able to watch and photograph them so closely. 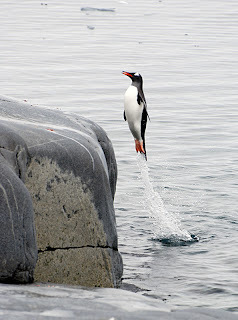 Out of water penguins are awkward and hilarious but in the water, they are graceful, and playful. To see them scooting around under your board or porpoising along in groups of 10 or 20 is a fantastic experience. We also saw Humpback, Minke, Orca and Beaked Whales. The Orcas we saw were spy hopping and breaching near a leopard seal stranded on an ice flow. With a coordinated effort, they created a wave, trying (unsuccessfully) to tip him off. 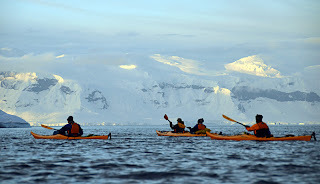 The kayaking was just amazing, paddling amongst bergs, pack ice and tidewater glaciers. 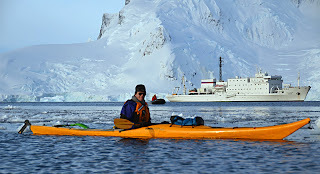 On most days, we’d have a couple of 2-4 hour paddling sessions and the ship might reposition in between trips. The kayaks were lowered by crane to the water on a zodiac, and then towed to where we would start kayaking. This was a pretty efficient way to get on the water and with a zodiac at our disposal, we had the flexibility to cover a lot of water and combine paddling with shore visits. We would paddle the coast or explore islands, sometimes going ashore to visit penguins and then call in the zodiac to return to the ship. We had a few paddles on still, magical days and a few downwinders with good stiff winds and swell. 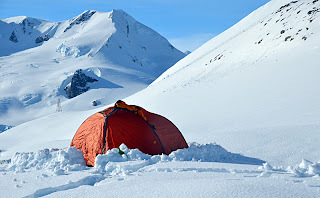 On our overnight trip, we camped in tents on the snow and enjoyed the wonderful long sunsets of the Austral spring with an early and warm sunrise. 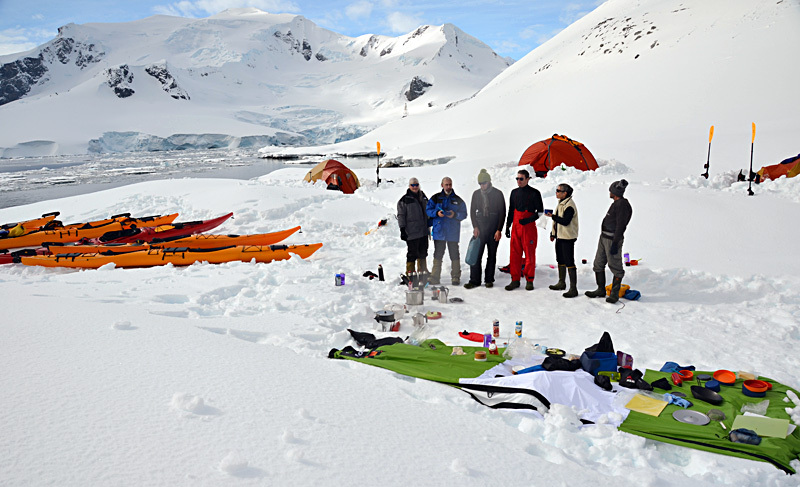 With temperatures swinging between -10 and +10 Celcius, and all those ice cubes in the sea, having the right gear was essential. I was really comfortable in my Exped Waterbloc 800 sleeping with a Downmat 9 (and Air Pillow of course) underneath. I was snug and warm sleeping in the Venus III tent. All securely stored in Shrink Bag Pro drybags! 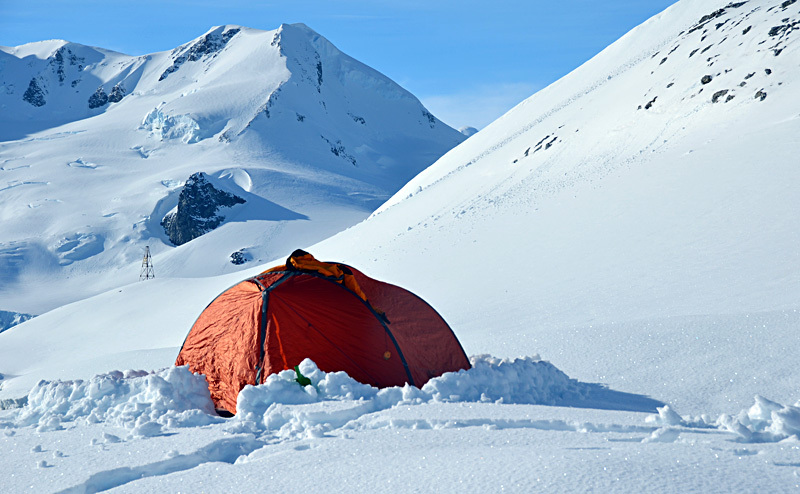 On another night our plans to sleep under the stars were scuttled due to changing ice conditions requiring a hasty retreat. The waterproof breathable Waterbloc sleeping bag along with my Downmat 9 (and Air Pillow!) was all that I would have needed. I also took along a Starboard inflatable SUP standup paddleboard and had a couple of great sessions in calm and lumpy conditions and even caught a couple of waves on a beach on Aitcho Island. 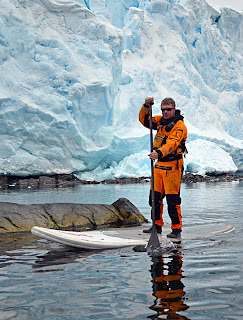 The SUP gave a better vantage point to see swimming penguins, the beautiful colours of underwater ice and made it easier to see a route through the brash ice. With the drysuit I was perfectly comfortable, even on the day that we were paddling in the snow. A few of the staff and other passengers also jumped on the SUP and One Ocean is considering SUP for future programs. The cultural and political history of the continent comes alive because it’s all so recent. 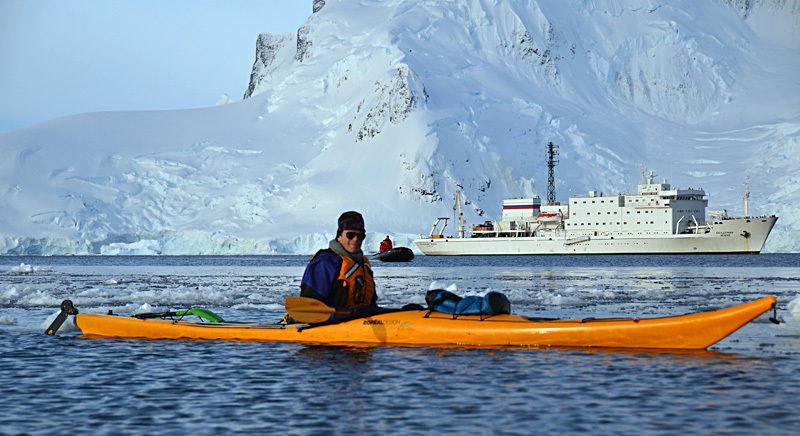 Since 1961, the Antarctic Treaty System has been effective at establishing moratoriums on oil, gas and mineral exploitation among other regulations and promoting international scientific cooperation. It is impossible to see this beautiful and pristine environment without considering the environmental and political challenges facing the Polar Regions and sense how directly it will effect our global ecosystem.